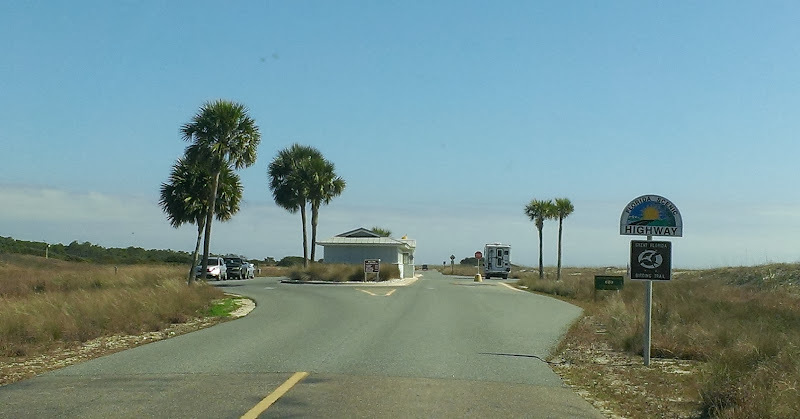 As mentioned in our previous post, when we checked in at Carrabelle Beach RV Resort, several people came over to talk to us. 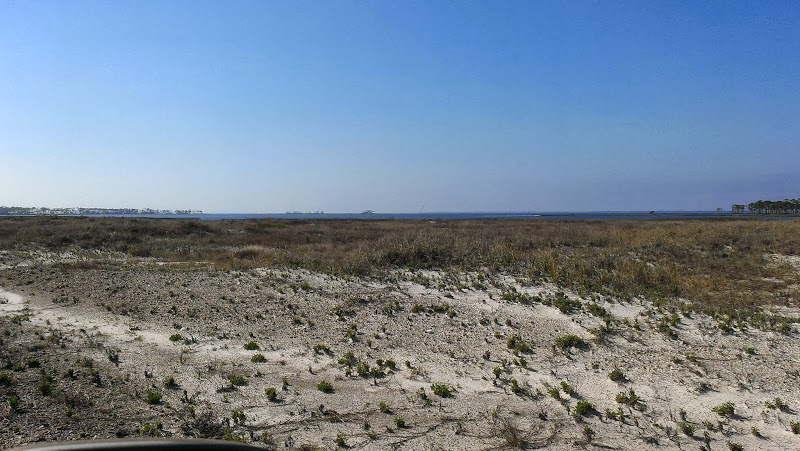 Typical conversation between RV’ers sharing thoughts on places they’ve been, but the first thing suggested was that making a trip over to St. George Island (could be seen across Apalachicola Bay from the resort) was an absolute must. Knowing that Thursday was to be a beautiful day and Friday was going to be rainy and we were leaving on Saturday, it was a no brainer deciding when to go to there. After some research on the island, I discovered that there were a number of bike trails so I suggested to Rob that we take our bikes with us. That turned out to be a good move! 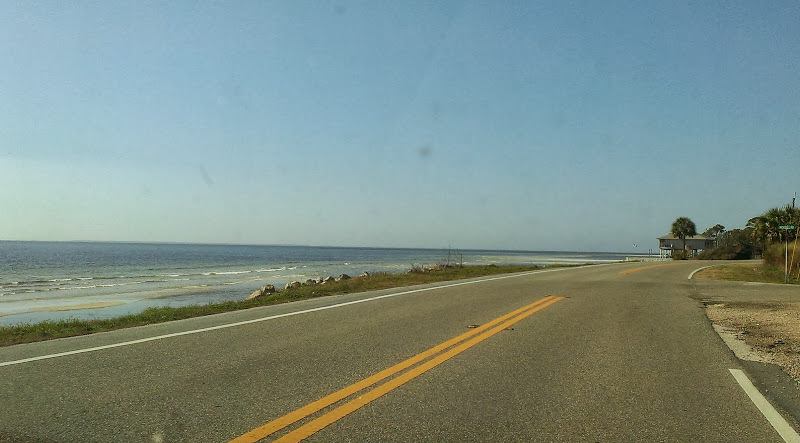 After a quick breakfast on board, we headed out driving along the coast on US-98W/US-319S. 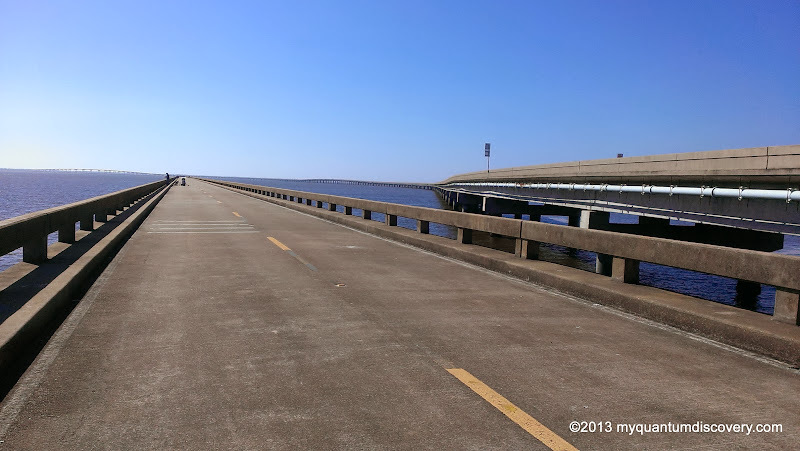 Turning onto SR-300 at Eastpoint, we crossed over the the 4-mile long St. George Island Bridge over Apalachicola Bay. When it was determined the existing bridge was unsafe, construction on a new bridge was started in 2002 and completed in 2004. The remaining end sections on each side of the old bridge are currently used as fishing piers. 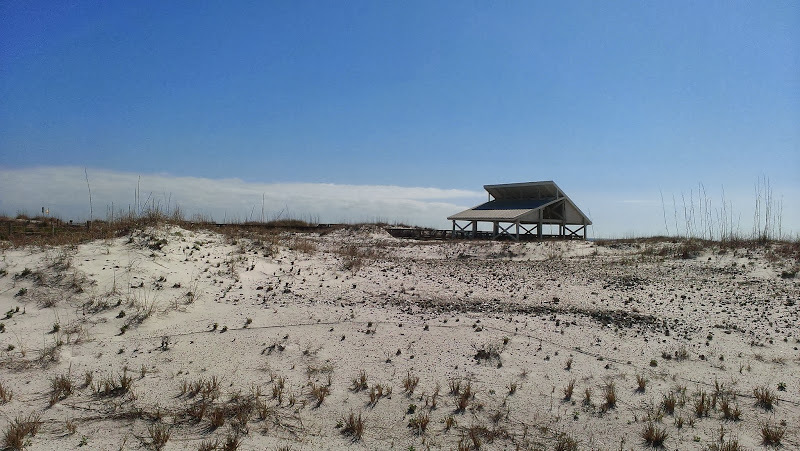 The 28-mile long and 1 mile wide St. George Island is surrounded by the Gulf of Mexico on one side and Apalachicola Bay on the other. 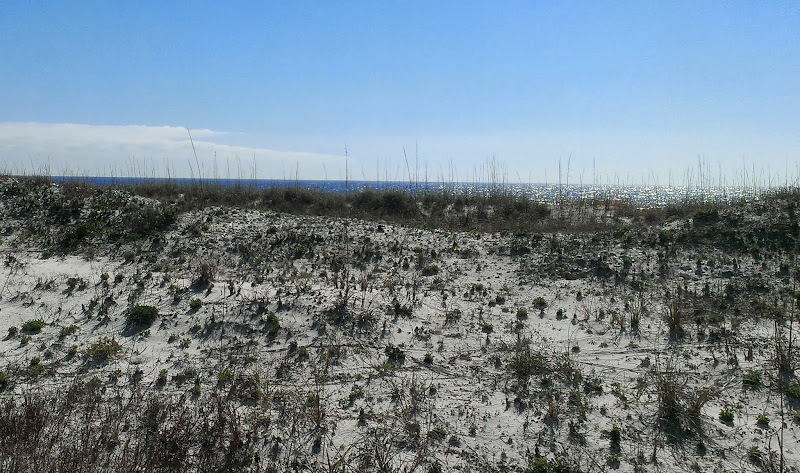 With it’s pristine beaches, it is one of the last inhabited yet unspoiled barrier islands in Florida. 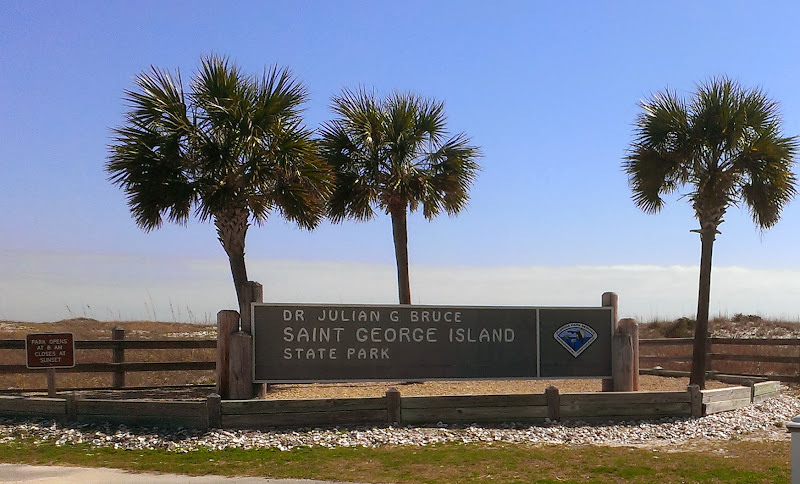 The Island is divided into three sections: the St. George Island State Park (also known as the Dr. Julian G. Bruce St. George Island State Park) which occupies the eastern 9 miles (1,962 acres) of the island; a public strip of restaurants, bars, small businesses, homes and a public beach; and a private, gated, highly exclusive housing community with its own airstrip that includes some of the most expensive multi-million dollar beach homes along the Gulf of Mexico. We took a quick drive through the more developed section where we stopped to take pictures of a lighthouse. Later I discovered that this lighthouse has quite a history to it. 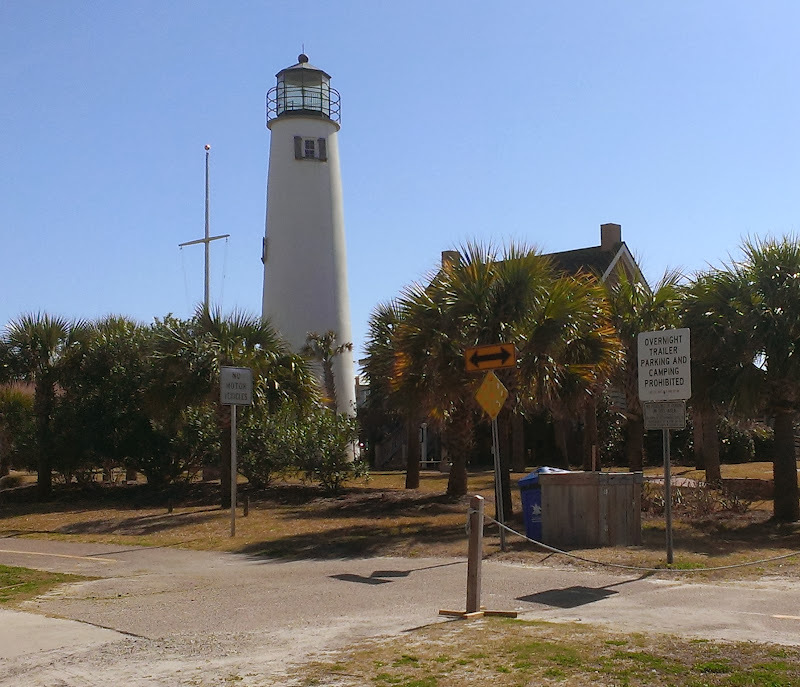 Originally built in 1852, the lighthouse was located 500 yards from the Gulf but by 1990 the beach erosion on the Gulf side of the island threatened the lighthouse. 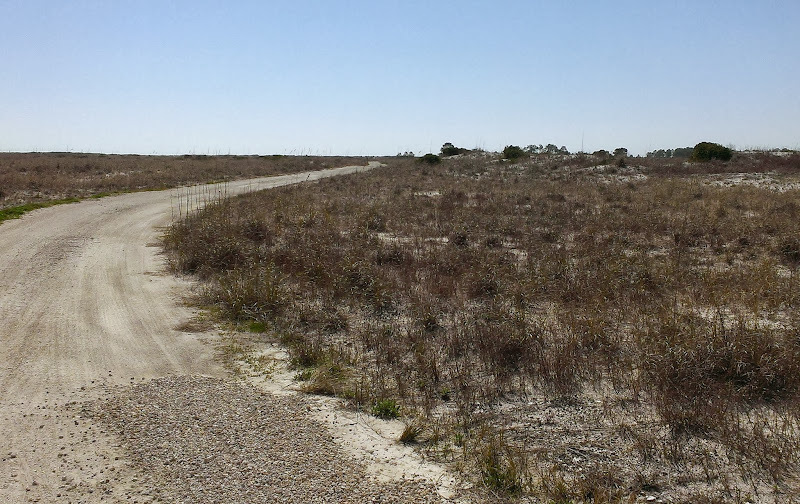 Then to make matters worse the remaining buffer zone was swept away by Hurricane Andrew in 1992. 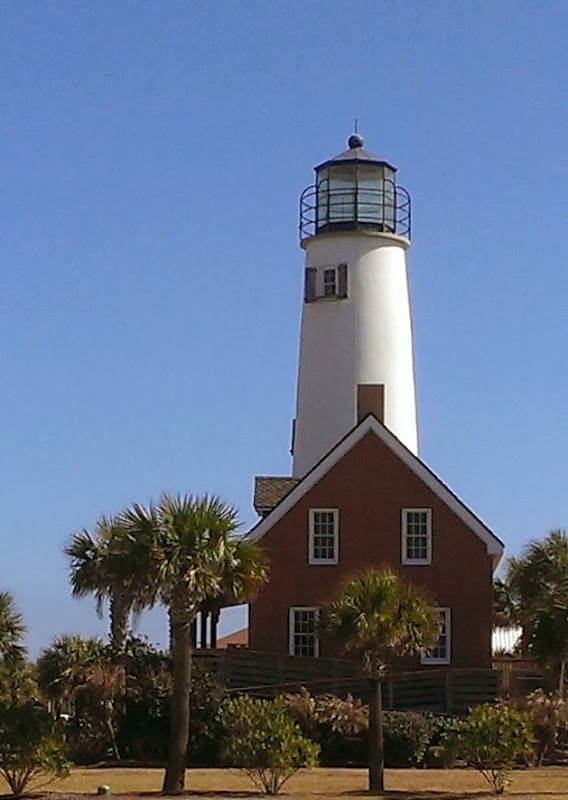 In 1994, realizing that the lighthouse most likely wouldn’t survive, the Coast Guard deactivated the light. 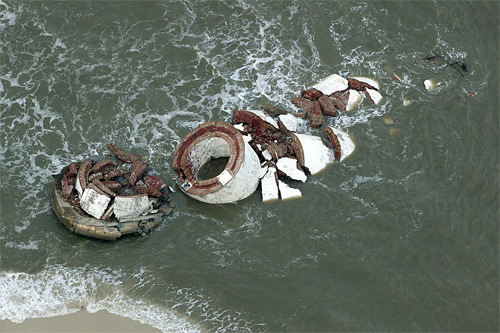 After several more storms and more erosion, the lighthouse was still standing but in shallow water and leaning until finally in 2005 it toppled into the water. 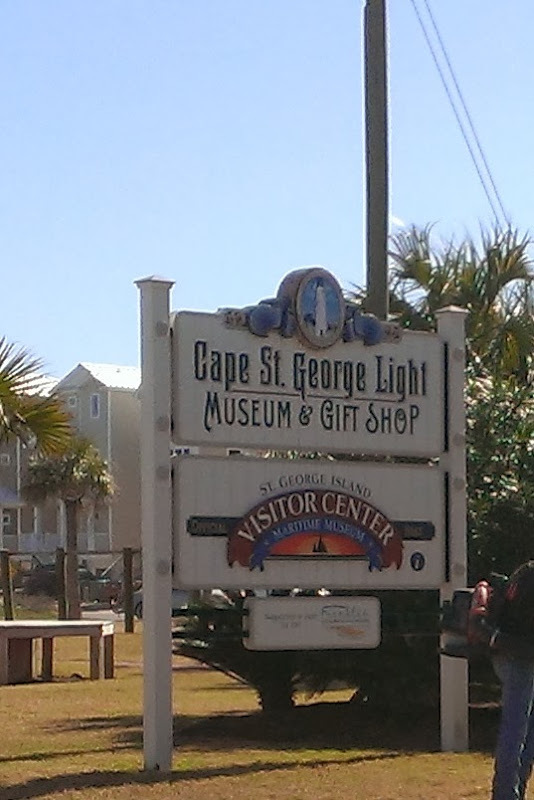 In 2009, a replica of the original lighthouse was completed in county park in town and at midnight on October 31, 2009 the Cape St. George Lighthouse was lighted for the first time since it had been decommissioned in 1994. A replica of the original lighthouse keeper’s house was built next to the lighthouse and opened in 2011 as a museum. Continuing on our way, after a short drive we arrived at the State Park where we stopped at the ranger station to pay the $6 entrance fee. 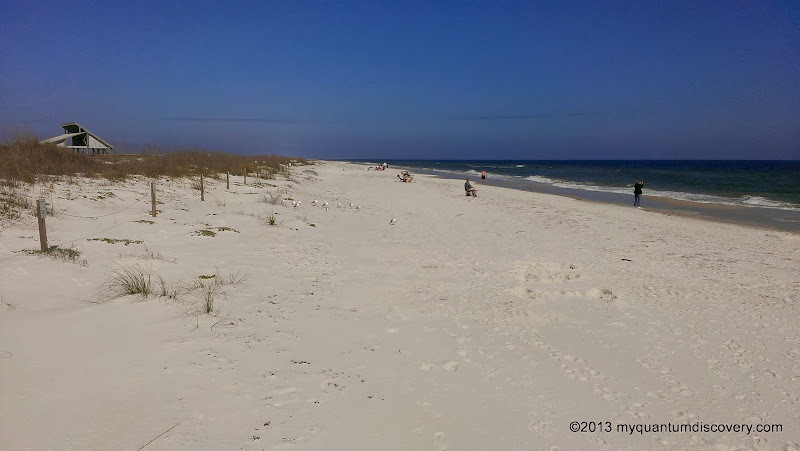 As we drove along, we were ooohhhing and ahhhhing over the scenery – beautiful rolling white sand dunes covered with sea oats with glimpses of the Gulf sparkling in the sunshine! Along the way there were numerous small pull outs near boardwalks providing access to the beach. Although the weather was absolutely beautiful, there weren’t many people at the State Park which was a good thing from our perspective. 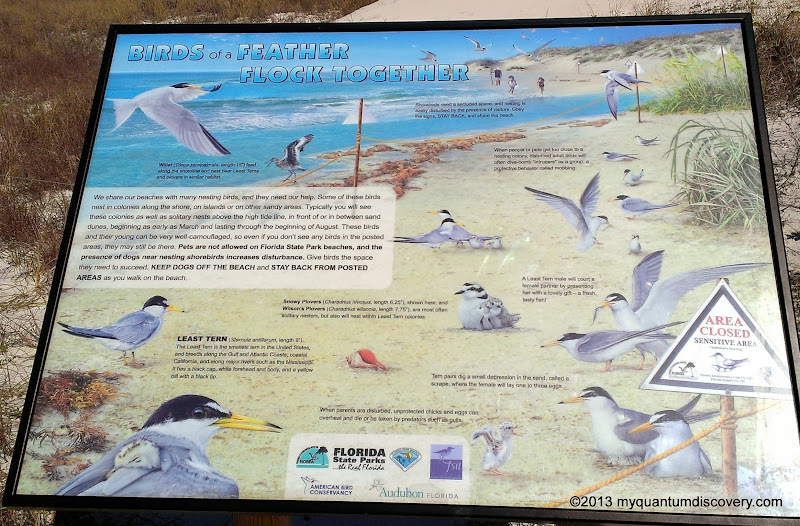 Too chilly yet on the panhandle for a lot of snow birds. I can only imagine how crowded it must be during the summer months. 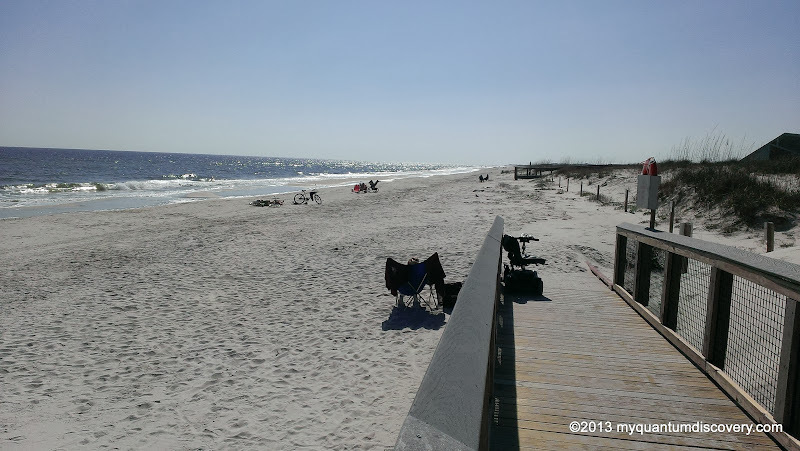 Every few miles we would pass a parking lot where there was a bathhouse, a picnic pavilion and a boardwalk providing access to the beach. As we neared the end of the park road, we took a left heading towards the Sugar Hill camping area to see what that was like. 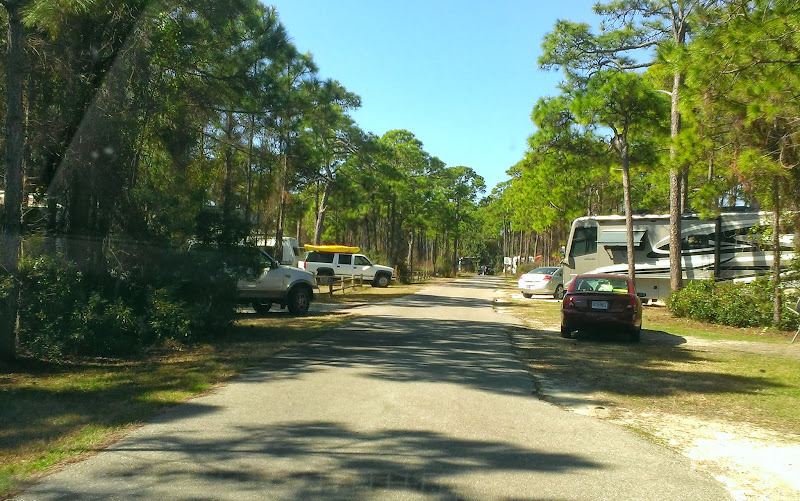 The campground has 60 sites with water (no sewer) and 50 amp electrical service, a playground, two bathhouses and a dump station. We were quite surprised to see how spacious and wooded the sites were. Very nice! 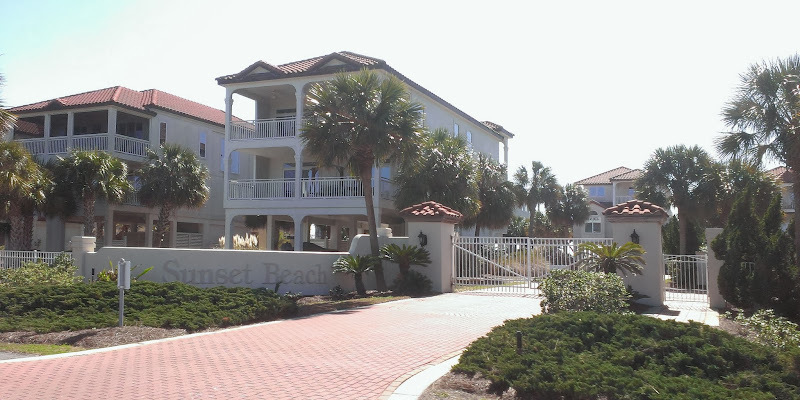 Although not right on the water, it’s just a short walk to the beach on one side and the bay on the other. 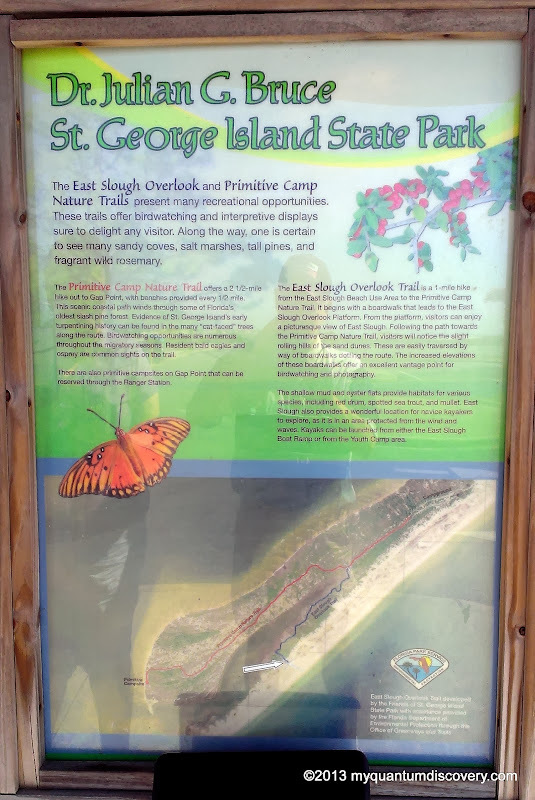 The 2.5 mile nature trail to Gap Point meanders from the campground through pine forests and coastal scrub to the bay. Unfortunately we didn’t have time to walk that trail. 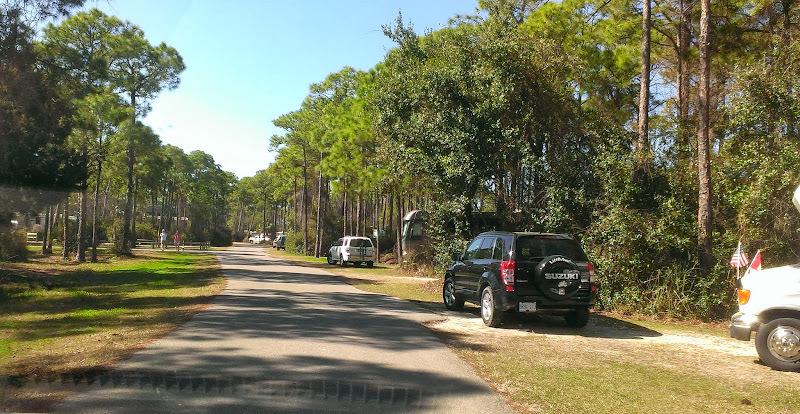 Once we left the campground we took a left back onto Park Road and headed for the Sugar Hill Beach area. From the bathhouse there was a beautiful view as you can see from the panorama photo that Rob took. We stayed there for a bit enjoying the view. 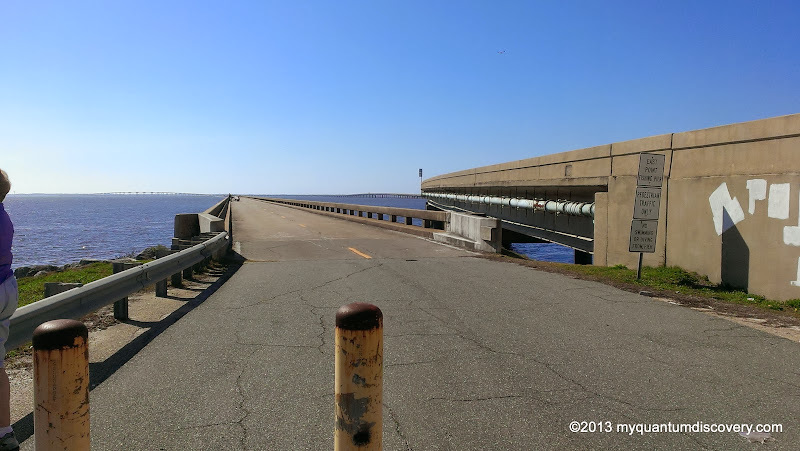 Nearby was a gated entrance to a bike/walking trail (actually a road) that leads to the east end of the island where St. George Sound and the Gulf of Mexico meet. 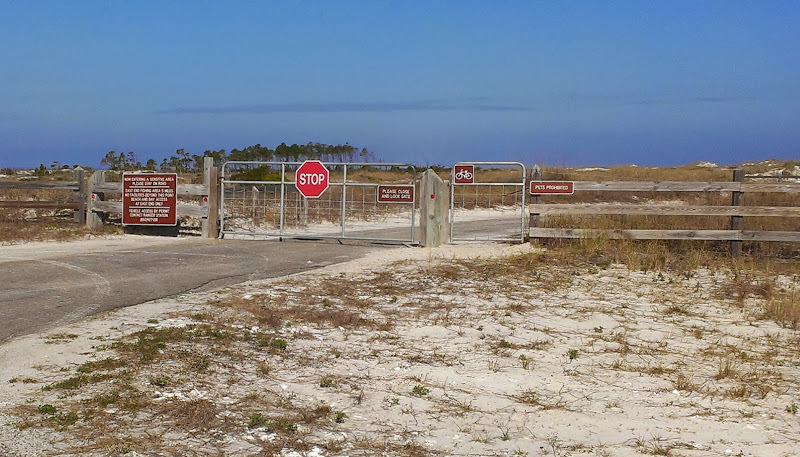 Vehicles can access this trail but only with the permission of the rangers who will provide the code to unlock the gate. On our bike ride we did see a few vehicles, mostly headed to the east end of the island which is a popular fishing spot (license required). Hopping on our bikes, armed with water, sunscreen and lunch, off we went with no idea of how long the trail was.The trail started off as pavement and then became packed sand so pedaling wasn’t too bad. 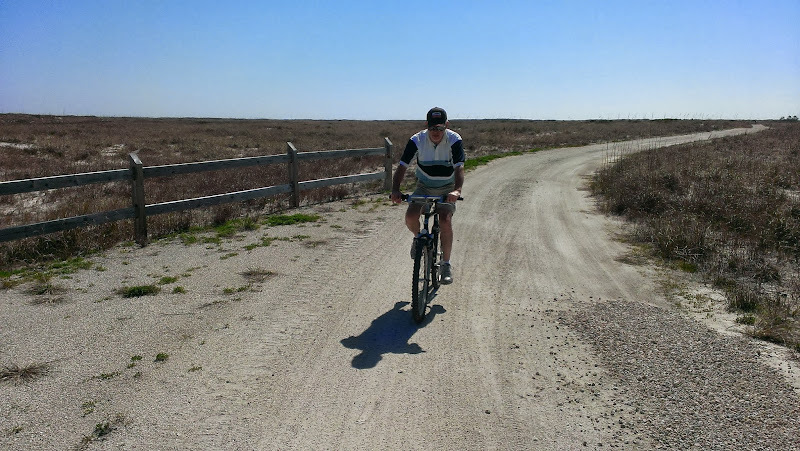 Occasionally there would be a sign warning of soft sand area ahead (not my favorite thing – pedalin’ in the soft sand is tough). 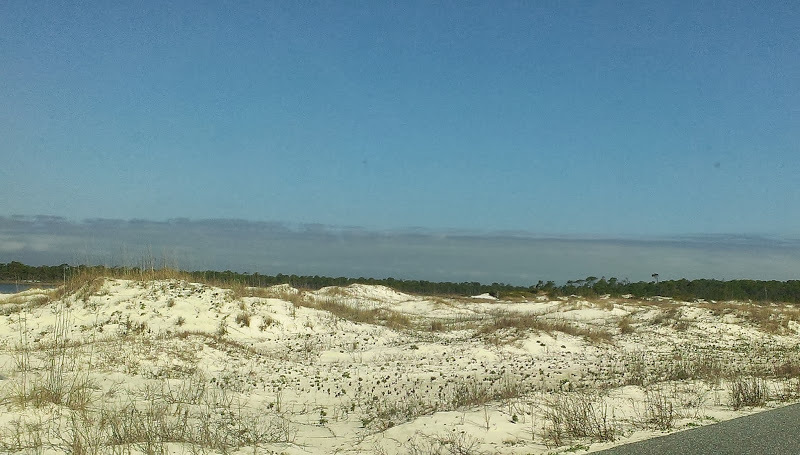 It was a little hilly as you would expect in an area of dunes but not too bad. Maybe at the beginning of the trip I might have whined about it but after all the biking we’ve done, a few small hills seems like nothing. After biking for awhile, I’d hear “we’re almost there” from my better half – I wasn’t sure exactly where “there” was but I sure was hoping the “there” would appear soon and that it would be worth the ride. What seemed like an hour (well, I lie, it was probably more like 15 minutes) later, I’d hear another “it’s just ahead…c’mon let’s keep goin’!” Then a few minutes later, “it shouldn’t be that far away. We must be almost there!” Yeah right! Reminded me of my childhood and family excursions where my brother and I would constantly ask my parents “are we there yet?” and we would receive the “yep, we’re almost there” response over and over again. Woo hoo! Finally! 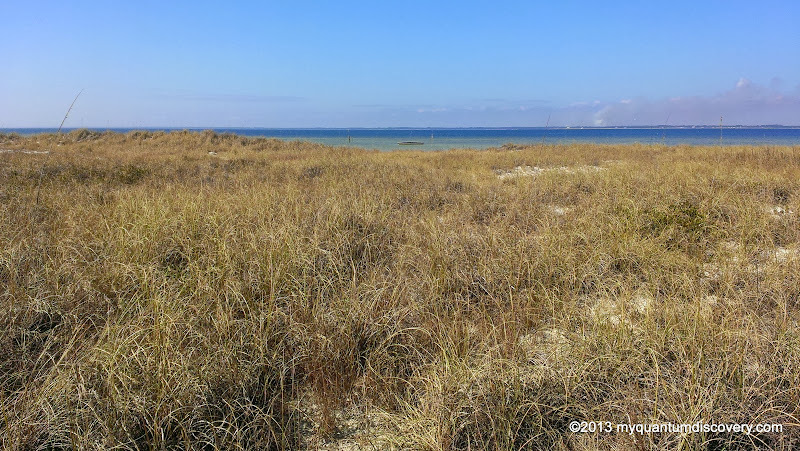 We were THERE – THERE being at the glorious eastern end of the island! 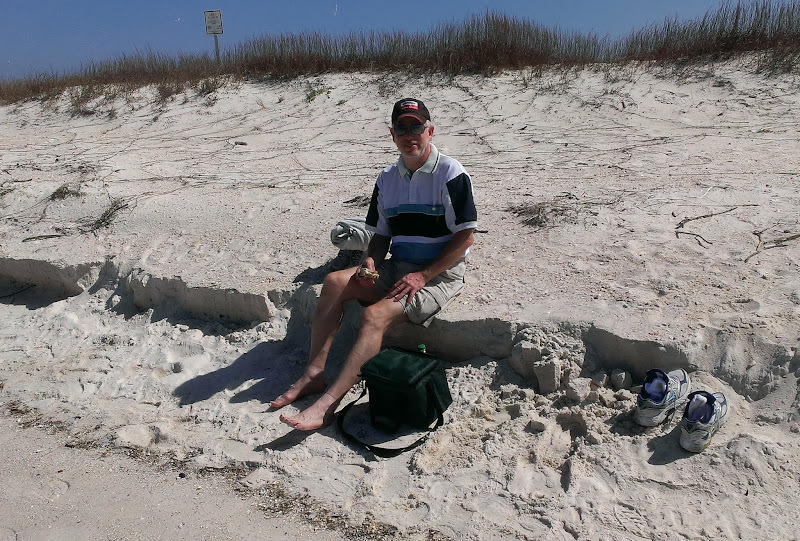 At last after pedalin’ over 4 miles (yes, I know 4 miles wasn’t really that big a deal but bicycling in sand is a little tiresome)! 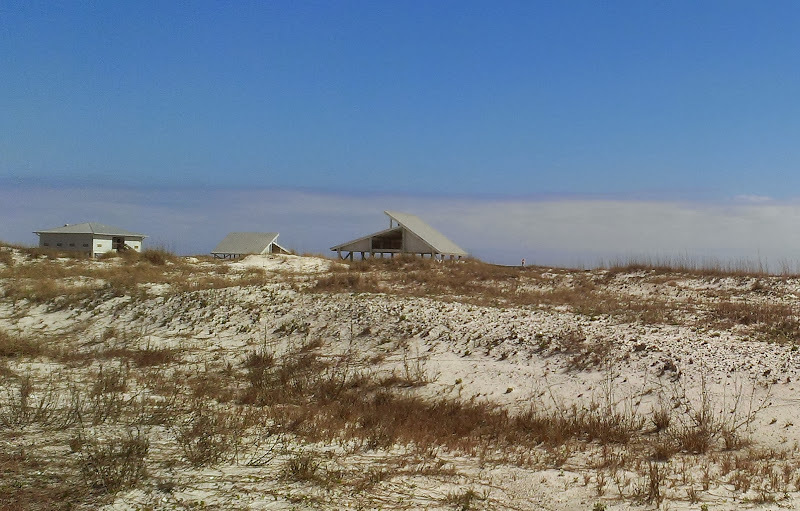 Quiet St. George Sound on one side and the crashing waves of the Gulf of Mexico on the other. WOW! Absolutely beautiful….I know, I know, I keep using that adjective but there’s no other word to describe it and even that one doesn’t do it justice. This is where I wish I had a way with words but sadly I don’t. Gorgeous, incredible, magnificent and totally awesome! All words befitting the scene in front of us. Yep, all of that and more! Only other humans in sight were sunbathing quite a distance away. 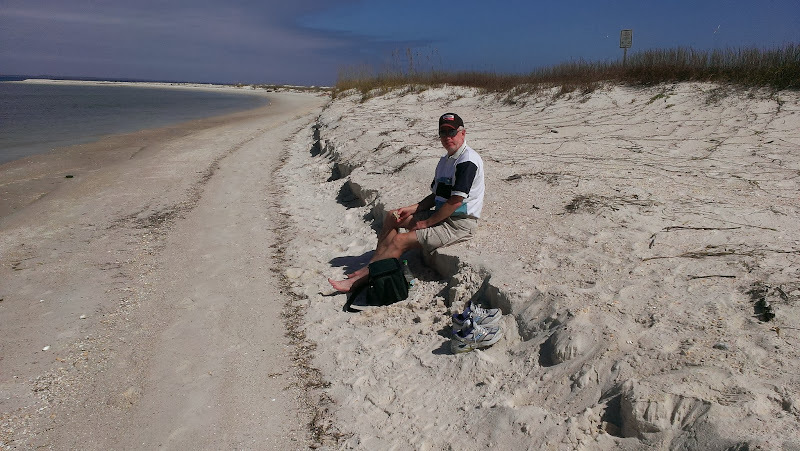 So it was just us and the birds – the beach was all OURS! 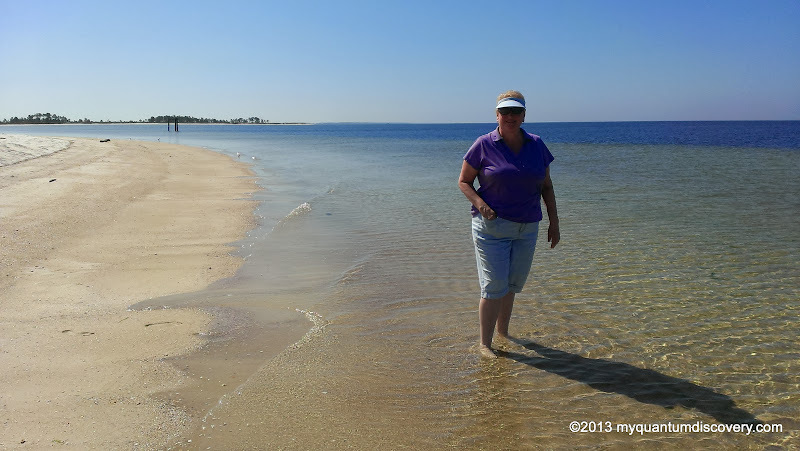 Off came the sneaks and the socks and into the water we went, wading up to our ankles….AAAHHH, yes, sighed our feet as the cool waves lapped our toes. How good that feels! Not exactly the temp of bath water but not too bad and very refreshing. I was wishing I could submerge my entire self into the water for a refreshing cool down but without the proper beach attire that certainly wasn’t going to happen. 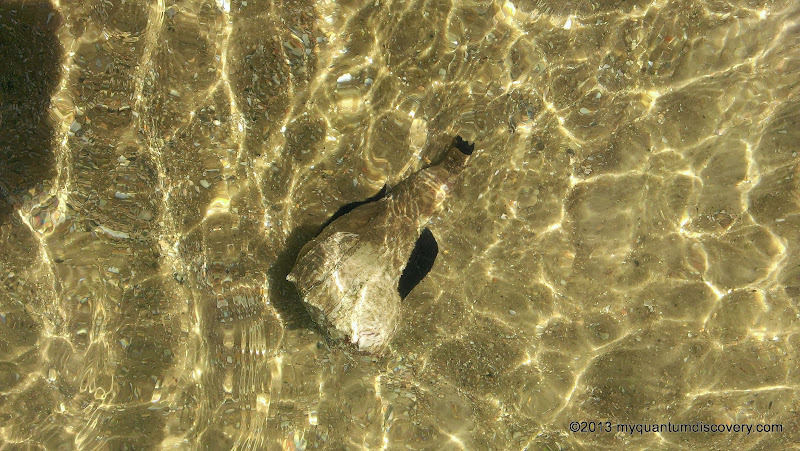 The sand was simply marvelous, silky soft, nary a shell, rock or clump of seaweed in sight. 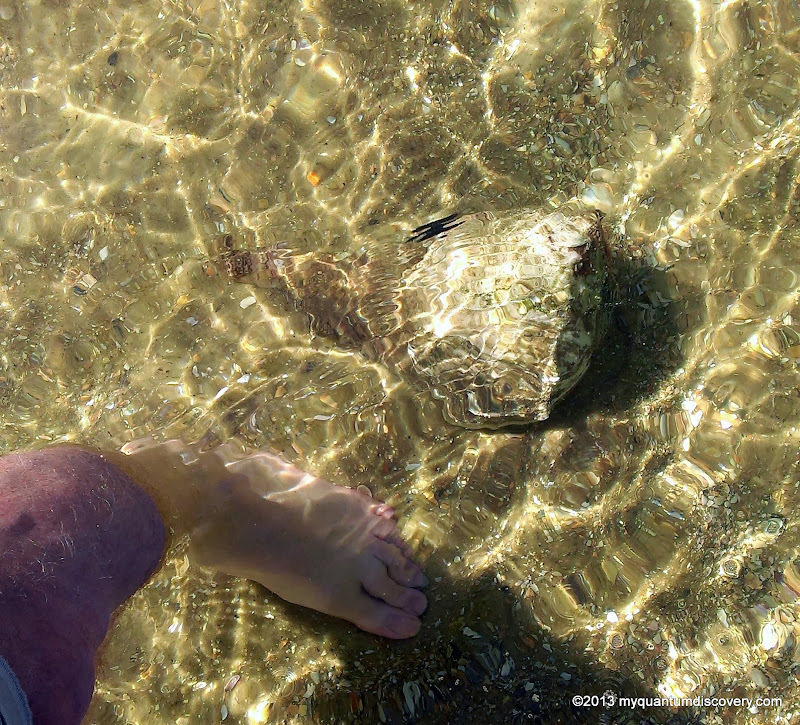 After skipping around in the water for a bit and watching a live conch do, well, absolutely nothing. I don’t think he moved the entire time we were there except when Rob gave it a little tap to see if it was alive but apparently he liked that spot and had no plans to go anywhere. Eventually we sat down on the embankment to have our sandwiches – boy, ham sandwiches never tasted so good. Alas, after lunch OUR beach was invaded by two other couples (car riding types), guess the guys were going to surf fish while the gals sat on the beach and yakked. No big deal, they didn’t invade our territory, setting up their chairs and rods a good distance from us. 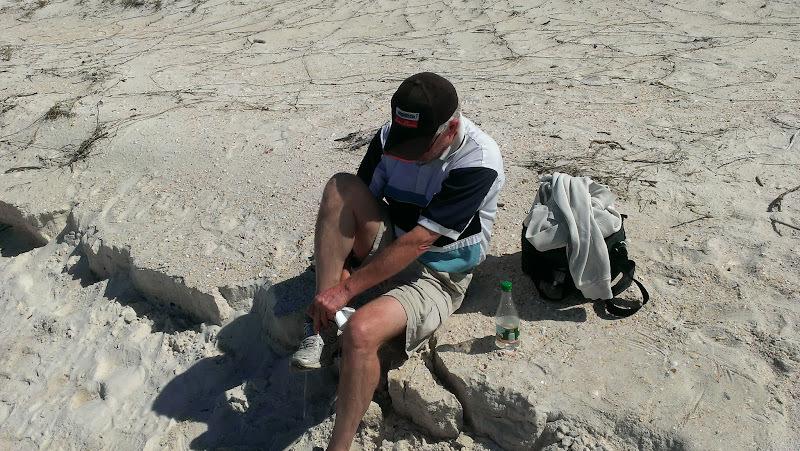 By then, it was time for us to scrape the sand off our feet (no easy task without a towel, just a couple of paper napkins), put our sneaks back on and hit the trail again. On our way back, I was almost run down by some wild Canadians speeding along the road in their car. Then we had to stop for a backhoe that was pushing some sand out of the road – that must be a never ending job! For some reason, the trip seemed a lot shorter going back. Why is that? It was the same distance after all. Did it seem shorter because we knew how far it was? Or was the first 4 miles a sufficient warm up so the second 4 miles were really easy peasy? When we got back to the parking lot we noticed a couple getting our of a car from Massachusetts so we stopped to talk to them. Turns out they were from North Attleboro which isn’t too far from where our house was in Norton. We talked to them for a bit then finally left. 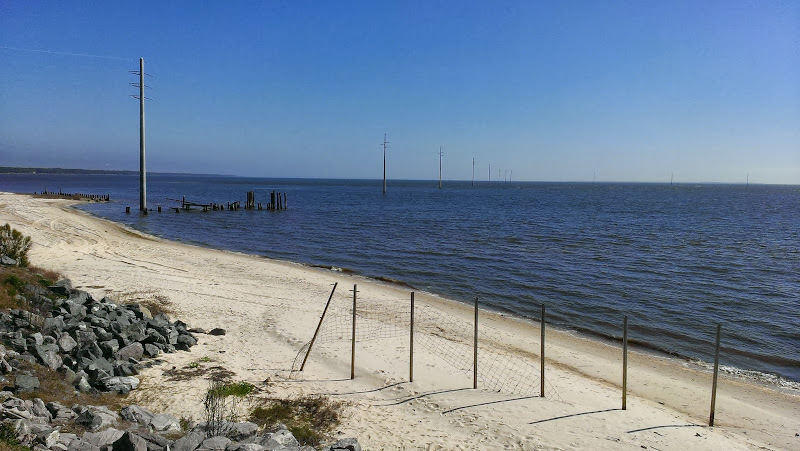 Our neighbors, Lee and Denise at Carrabelle, had told us about a restaurant er, dive/bar called Eddy Teach’s (a reference to Blackbeard) on the island which was famous for their Apalachicola oysters so we decided to stop there before heading back to the hacienda. More about that in our next post!